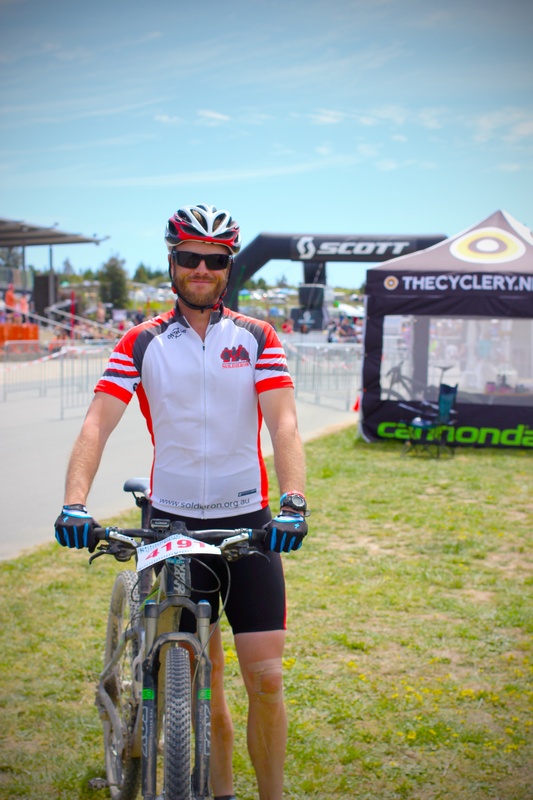 I was really looking forward to the possibility of racing in the Scott 25 Hour after riding in The Mont earlier this year as part of a six-person team for The Berm. 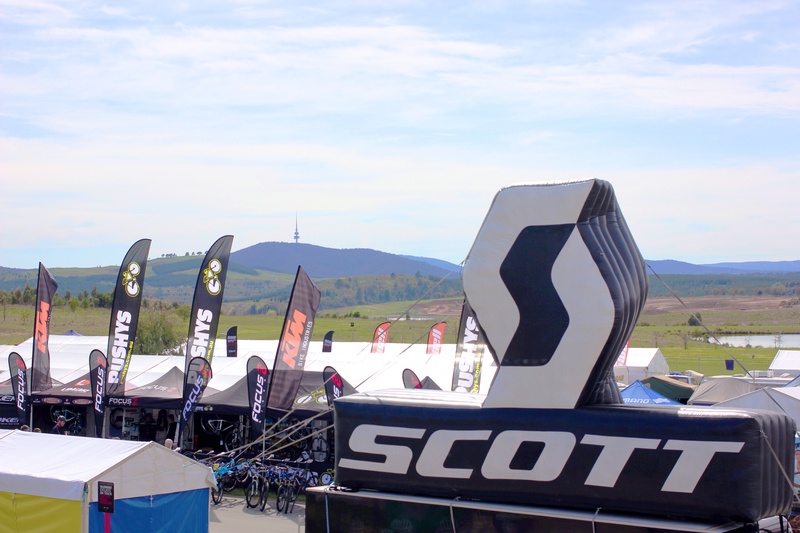 It was a little difficult organising another Berm team for the Scott due to Mt Stromlo being the venue, the Scott being smack bang in the middle of the spring racing season and a week before the 24 Hour Solo World Championships. A month out and it wasn’t looking like I would be donning the lycra and riding laps around Mt Stromlo until Adam “Rocket” Rolls threw me a lifeline needing a ringer for his team of four. 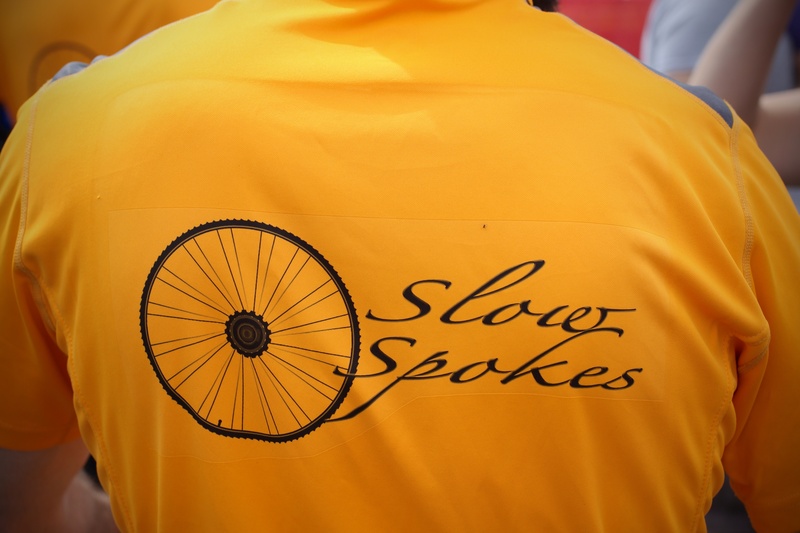 I jumped at the opportunity and would soon be riding with team Slow Spokes. 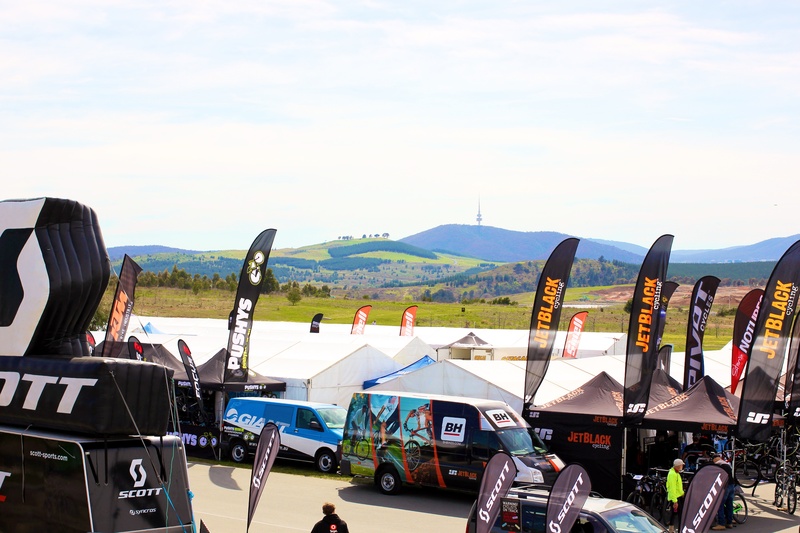 I drove out to Mt Stromlo on Friday to set up my tent and check out the event centre. 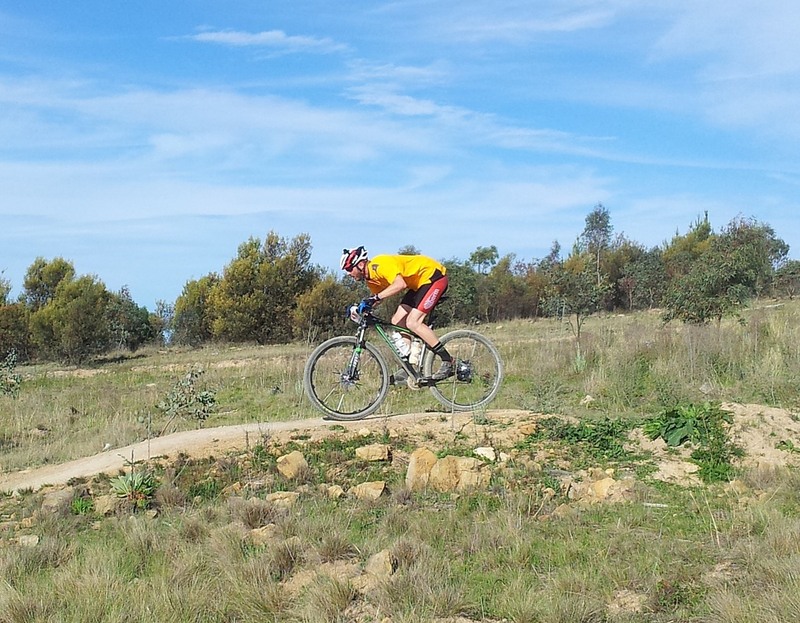 The weather was forecast to be a perfect Canberra spring long weekend and the Mt Stromlo trails were in excellent condition. 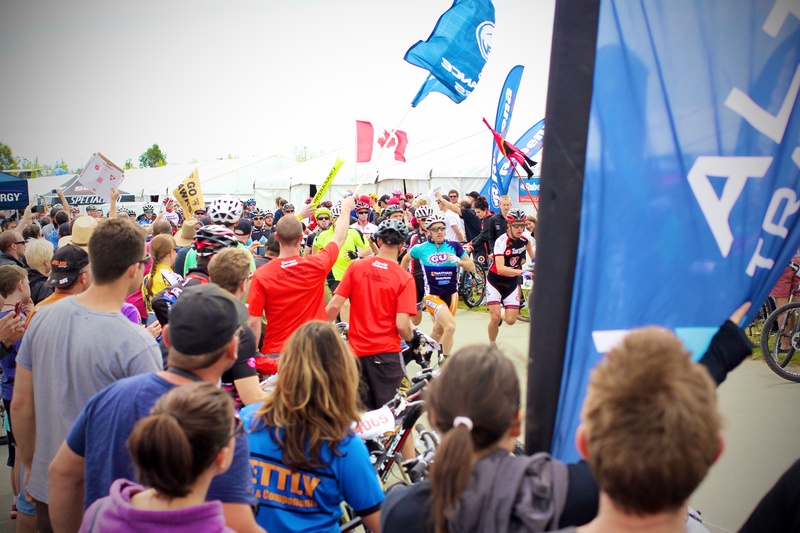 My lead up training for the Scott had been less than ideal with a month spent off the bike and I was still dealing with the final stages of a chest infection. 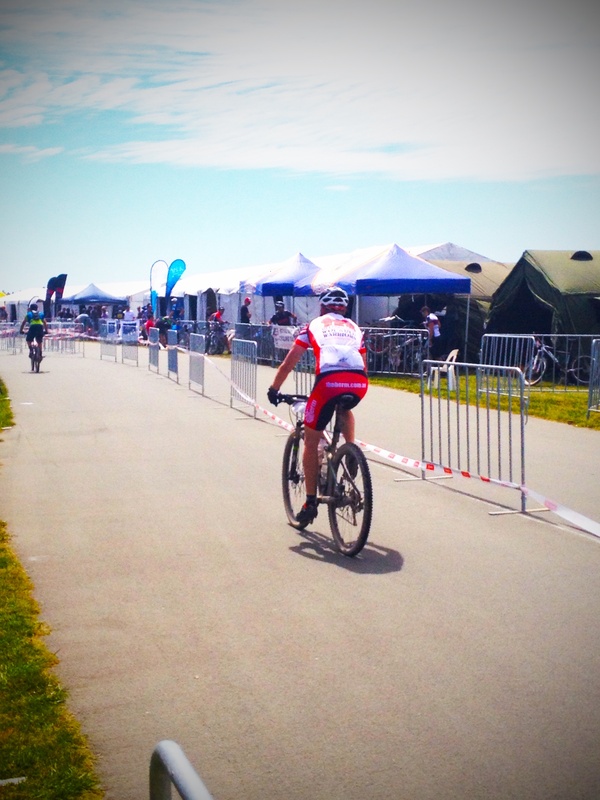 I knew I wasn’t going to be posting super-fast times during the race; but was more than happy just to be riding. 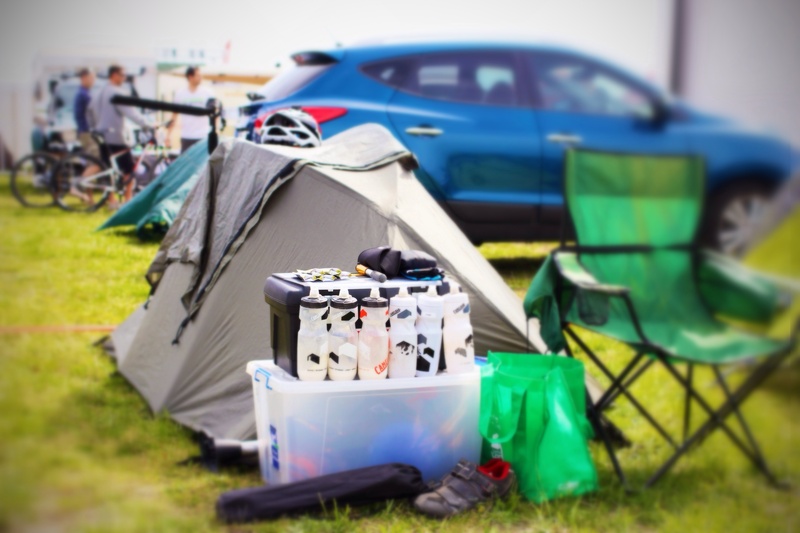 When the whole team, Adam, Nigel, Dave and myself were all there we registered for the race and headed back home for a big dinner and good nights sleep in our own beds before a weekend of caffeine, junk food, no sleep and lots of riding.
.:The Scott 25 Hour event centre:. 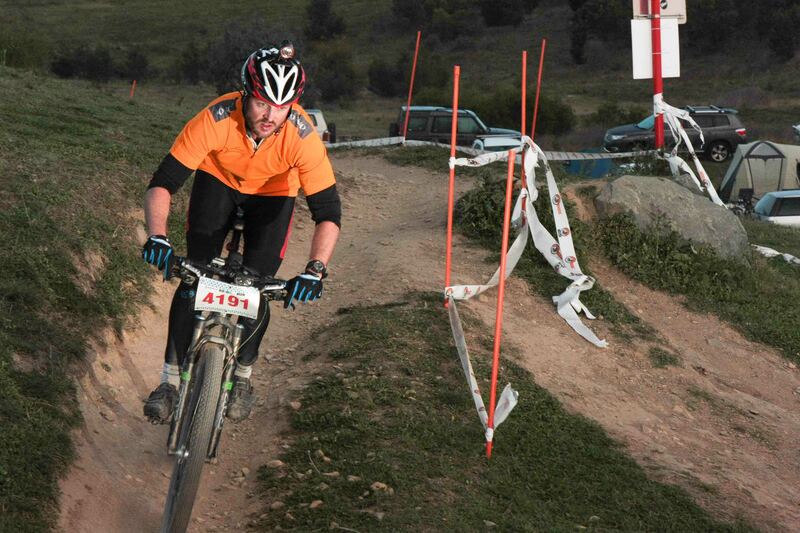 I arrived at Mt Stromlo early on Saturday morning to find the entire area a hive of activity. The venue was already in full swing with a heap of riders getting in some last minute practice before the course was closed. 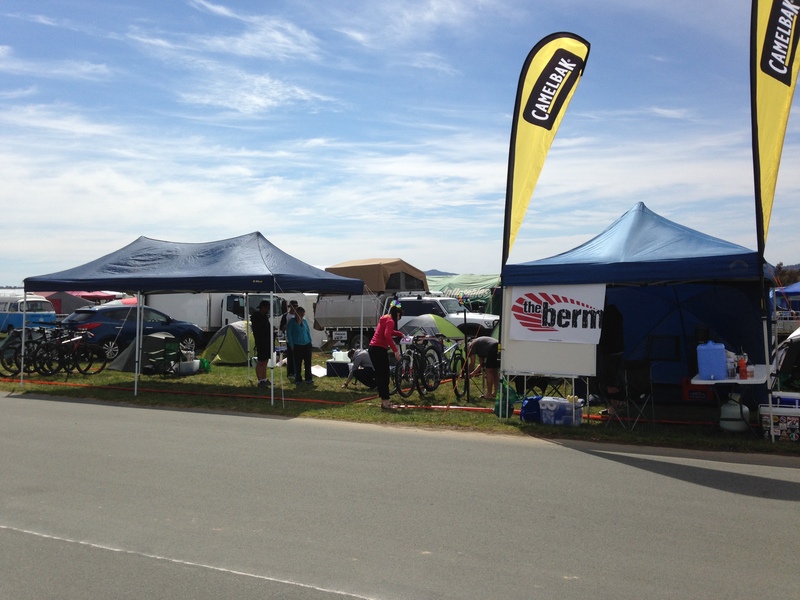 We went about setting up our race HQ track-side; just up from transition and the event centre.
.:Kate waiting for her race plate:.
.:My home for the weekend:. 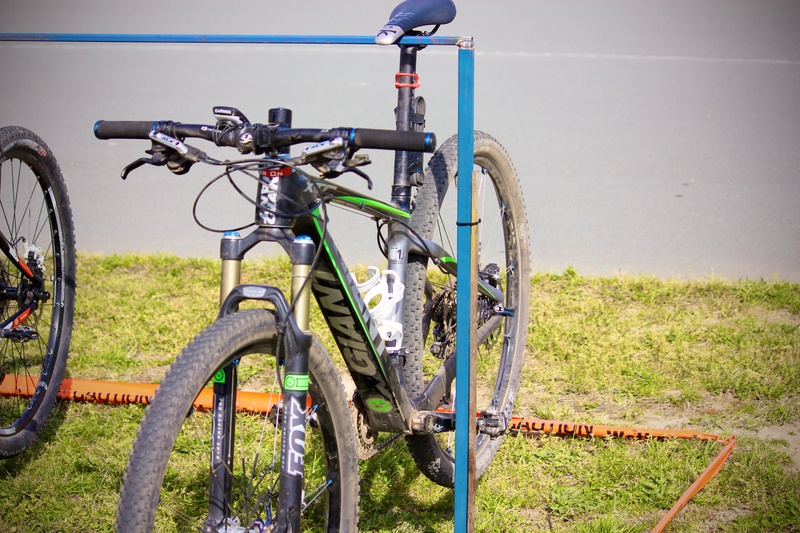 There was a little bit of hurry up and wait leading up to the 11am race start with some last minute bike maintenance, gear set-ups and race briefings beforehand. Once the rider’s brief was over Adam limbered up and got in place for his short sprint in the Le Mans start. Once Adam was on his way we sat down and worked out the order the rest of us were to ride. I drew third rider and so began the confusion of which lap each of us would be riding on for the next 25 hours. Lets get one thing straight, it isn’t a difficult concept by any means, there are two loops; the Red Loop and the Blue Loop. We started on the Red Loop which meant Dave would be riding the Blue Loop after Adam finished the Red Loop and came through the transition point at the Blue Loop start point. 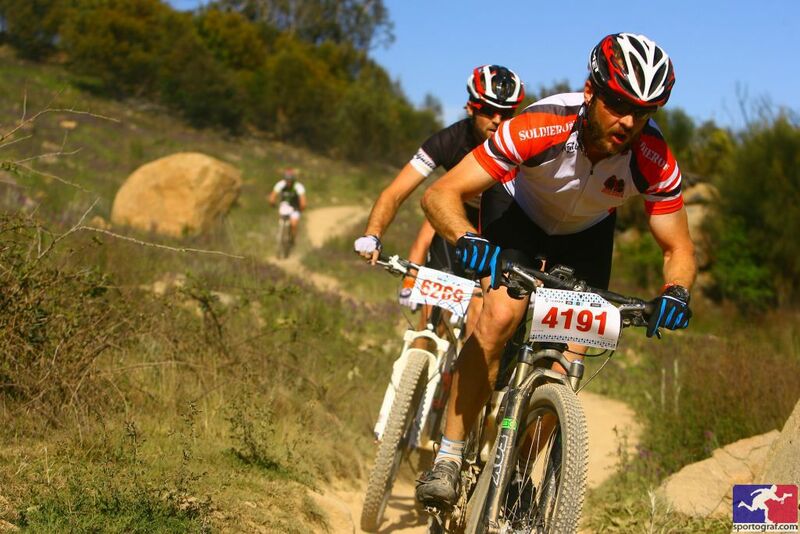 My first lap of the course was the Red Loop which was up the Mt Stromlo switchbacks and down the mountain via the bottom of the downhill track. A few hours before the race start I discovered I had been practising on the wrong part of the course and had in fact never ridden the last 2km of the Red Loop before. Not to be deterred I figured I’d just take it easy and learn that part of the course before I had to ride it in the dark later that night. I took off out of transition and powered along the crit track into Fenceline and then into the switchbacks starting the ascent of Mt Stromlo. I enjoy riding these tracks and soon found a nice rhythm all the way up and onto Western Wedgetail where I set my forks to ‘descend’ and took off down the hill towards Skyline and Luge. Once I exited Luge I entered the part of the course I hadn’t seen yet. I will never be a downhill rider based on one factor alone: self preservation. I baulk at drop-off’s and very rarely launch my bike into the air on purpose. So to be faced with multiple drop-off’s, jumps, and steep declines into sweeping berms; I was well and truly out of my comfort zone with my self preservation light blinking brightly in front of my eyes. I made it to the bottom in one piece and quickly speed around the crit track into transition to send Nigel on his way out onto the Blue Loop. I was feeling fairly good after my lap and tucked into a plate of dutch pancakes with ice cream to celebrate. 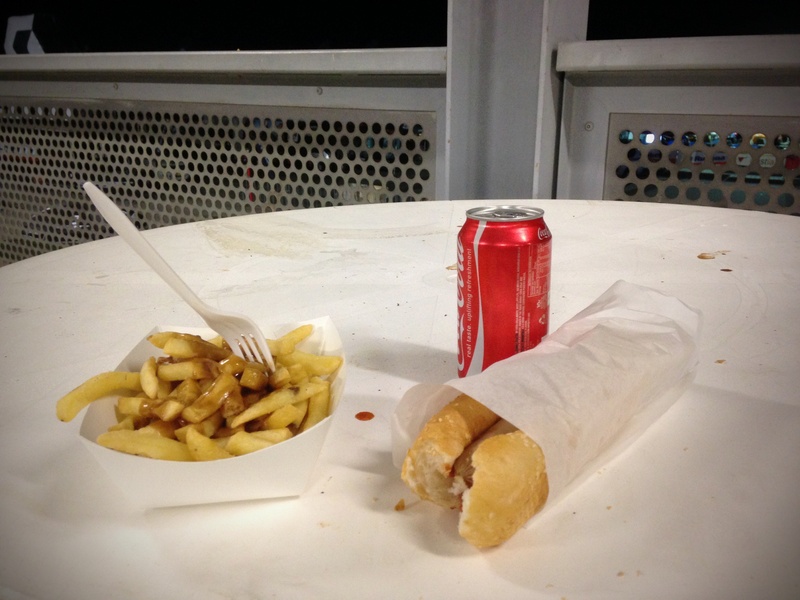 Nutrition and hydration are extremely important when riding and even more so when racing. Everyone is different and has different dietary requirements. A lot of riders eat fruit, especially bananas. I can’t as I will vomit most fruit and I’m very allergic to the potassium in bananas. Because of this I rely on a rotating hydration plan of water, protein drink and electrolyte drink. I can hydrate for days prior to a race and be on top of my electrolytes during and still get cramps. Whatever advice I am usually given about cramps is doesn’t help me as most ‘remedies’ will actually make it worse for me. The only real thing that helps is a low electrolyte, high carbohydrate, high protein hydration/nutrition combo during and after each lap. Soon I was off on my next laps; a loop of both the Red and Blue Loops. Once again I made the ascent and descent of Mt Stromlo and rode into transition; but instead of tagging the next rider I made a sharp u-turn and headed out onto the long fire-road up to Blackberry Climb. I had mistakenly thought this was to be the easy loop due to it not incorporating a fairly steep climbing section; but I was wrong. Each track included an ascent of some sort and in comparison to the downhill section of the Red Loop there was very little time for free-wheeling at speed.
.:Me riding down Double Dissolution (thanks to Brett for this awesome picture):. After an hour and half rest it was time to put the lights on my bars and helmet and head out for my fourth individual and the team’s twelfth lap. It was still light by the time I headed off but I needed the bar light on for the last 3km of the Blue Loop. When I got back to our race HQ it had already cooled down dramatically it had now transitioned into night riding with a number of teams retiring for the night. Night riding is a special experience for mountain bikers. You can have your entire bar covered in lights and your riding will still be vastly different from your day riding. I run a double bar light and single helmet light set-up that I use on low to medium setting when riding at night. I find I can see more of the track detail with the lower settings than with my lights burning shadows onto the trees. So as I headed out for my first night lap of the Blue Loop I was confident I knew the tracks well enough to stay out of trouble. I was glad I had donned my knee warmers and long-sleeves as the temperature had dropped to single digits. The lap itself was non-eventful as a large portion of the field was only riding during the daylight hours which opened up the course and allowed passing and being passed easy and a rarity. I was able to get a couple of hours rest before my next ride; another double loop. I emerged from my tent still wearing my long sleeves and now wearing my full length leg warmers to meet the now colder Canberra night. This time it was the Blue Loop followed by the Red Loop. The Blue Loop was almost a blur; I only saw four other riders and only one of these passed me and that was very late in the ride. The Red Loop started off normally with the ascent followed by the descent towards Red Octane; the lower part of the downhill course. It was at this point that my tiredness got the better of the me and I second guessed myself and switched which line I was to take at the drop-off. Through-out the day I had taken the ‘A-line’ and hit the drop-off with speed and held it without any real issues. Well at around 2am I turned right towards the ‘B-Line’ and missed the corner and experienced a front wheel washout that sent me onto my shoulder and halfway down the drop off before getting back up and heading back into transition.
.:3am post double lap snack:. I was lucky enough to draw the dawn lap of the Blue Loop for the start of Day 2. I needed my lights on during the first few kilometres and then watched as the sky turned pink and the sun rose over Canberra.
.:David B’s awesome photo at the end of the Blue Loop:. My second last lap was the Red Loop in what felt like stifling heat. I pushed up the climbs trying to avoid what felt like cramping about to hit. I alternated my position in the saddle to give my quads a slight rest before digging a little deeper to get up to Western Wedgetail in an attempt to make up some time on the downhill into transition. My final lap hurt; I won’t lie. I had started to cramp up but was still keen to get my tenth lap under my belt to get over the 100km mark. I took off for the Blue Loop as fast as my aching legs could take me. I enjoyed this lap immensely and knowing that my wife was waiting for me in Race HQ I pushed out of the singletrack and onto the crit track as hard as I could. When I finally got back to the rest of my team I had ridden a total of 111.5km.
.:At that is the end of the Scott 25 Hour for me!:. 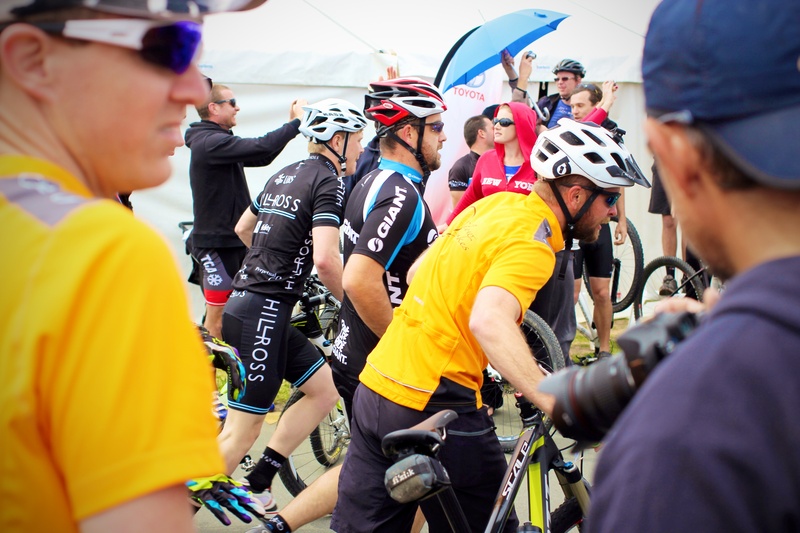 As a team, Slow Spokes completed 38 laps and covered 417.24km to finish 20th in our category and 74th overall. 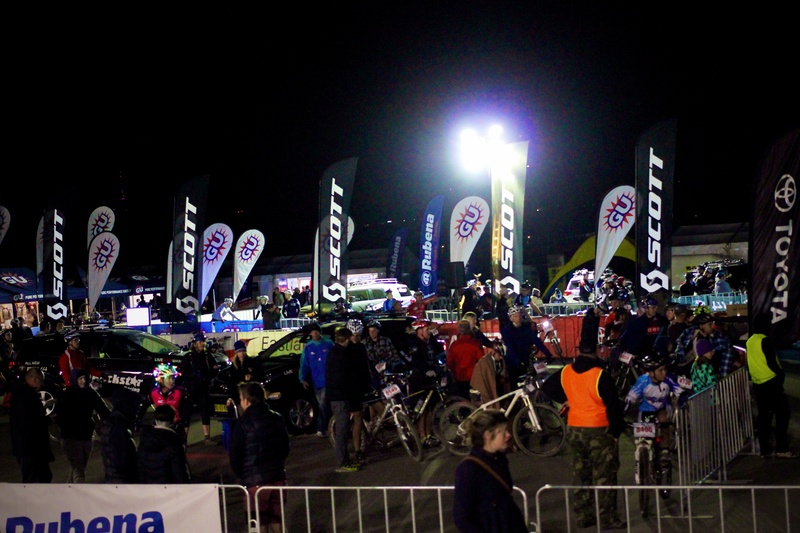 I enjoyed riding in the Scott 25 Hour in 2013 immensely. It was a fun and challenging experience; but it lacked a little something. It didn’t have the vibe that the Mont 24 Hour had and because of that I found the motivation to keep peddling lacking at some points. Would I do it again next year?… I believe so. I’ve probably asked you this already, but what handlebar width are you running on Kate? that’s really interesting. yeah I was just curious because by eye, they looked narrow. Love the pancakes fuel Chad and extra points for naming your bike! Another great post mate! “…I enjoyed this lap immensely and knowing that my wife was waiting for me in Race HQ…” That was nice to read, bet it felt even better to write!